2 A special structure in English, it's a device used to turn a statement into a question. It nearly always consists of a pronoun, a helping verb, and sometimes the word not. 3 1 st : the subject in the statement matches the subject in the tag. *You have passed the exam, haven't you? 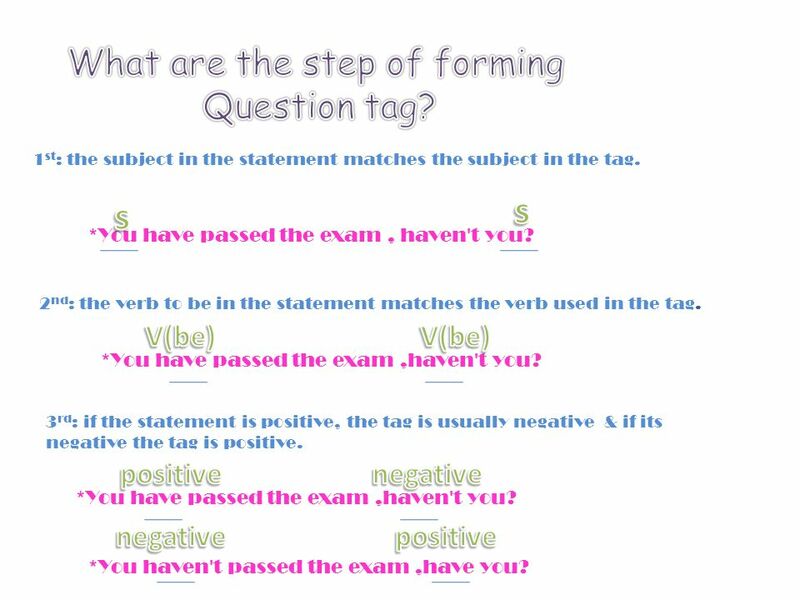 2 nd : the verb to be in the statement matches the verb used in the tag. *You have passed the exam,haven't you? 3 rd : if the statement is positive, the tag is usually negative & if its negative the tag is positive. *You have passed the exam,haven't you? *You haven't passed the exam,have you? 5 According to the truth, We often answer this question by yes or no..but sometime we answer it by repeat the tag and reverse it. *We have a lot of work in HD1, haven't we? *We haven't a lot of work in HD1, have we? -Yes we have -The answer is the same in both cases,because we have a lot of work to do in HD1. 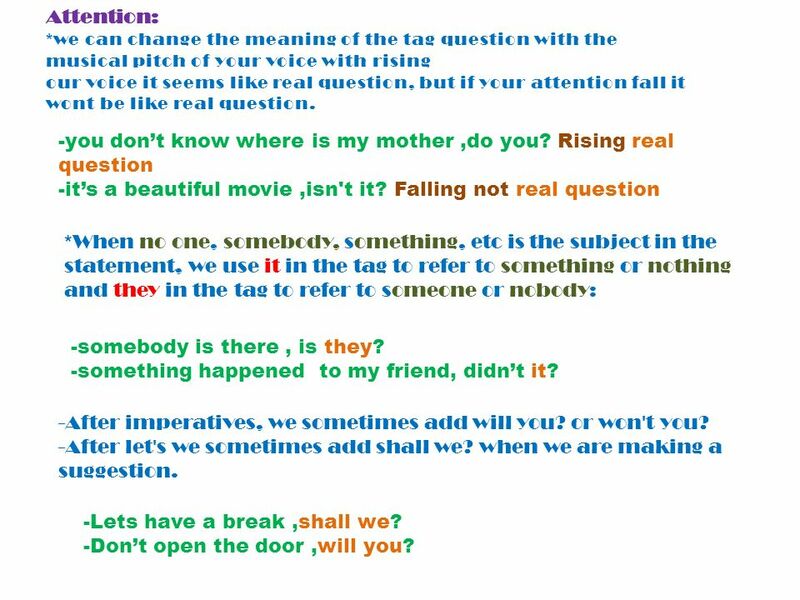 6 Attention: *we can change the meaning of the tag question with the musical pitch of your voice with rising our voice it seems like real question, but if your attention fall it wont be like real question. -you dont know where is my mother,do you? Rising real question -its a beautiful movie,isn't it? Falling not real question *When no one, somebody, something, etc is the subject in the statement, we use it in the tag to refer to something or nothing and they in the tag to refer to someone or nobody: -somebody is there, is they? -something happened to my friend, didnt it? -After imperatives, we sometimes add will you? or won't you? -After let's we sometimes add shall we? when we are making a suggestion. -Lets have a break,shall we? -Dont open the door,will you? 7 1-Something is missing, ………………..? 2-Lets do some exercise,………………..? 3-Im right,………….? 4-Dont leave the home,………….? 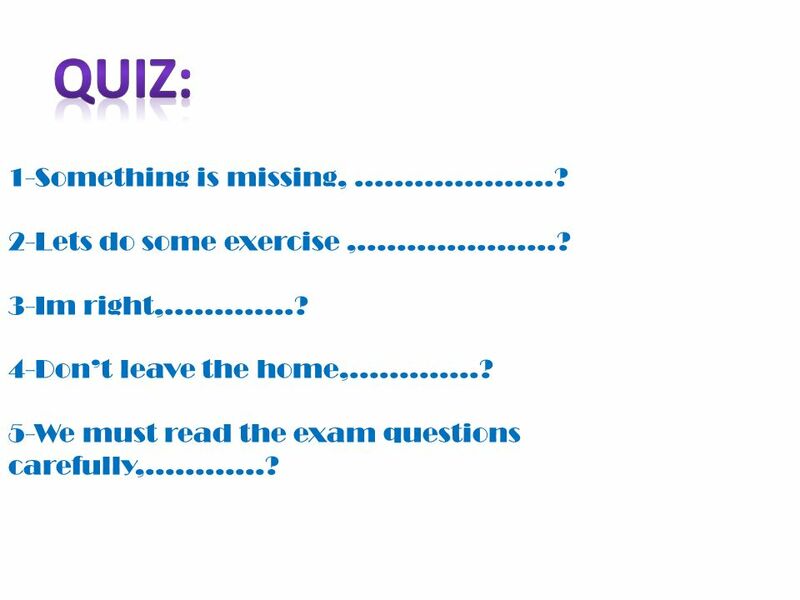 5-We must read the exam questions carefully,…………? 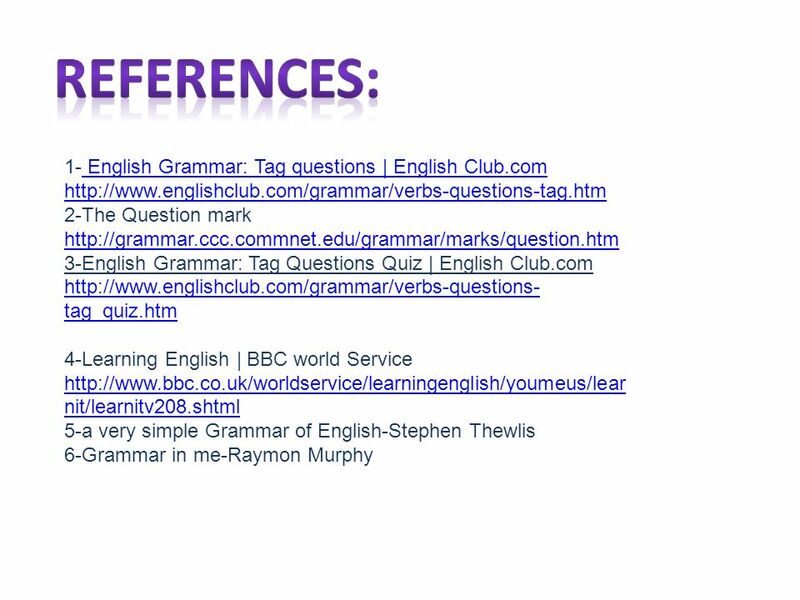 Download ppt "Is something small that we add to something larger.. a sentence in an interrogative form, addressed to someone in order to get information in reply.. www.el9a7rah.com/learn;"
How to make question in English?? Done by :Hessa wwww.el9a7rah.com/learn. Author: Atilano Olvera Palacios. 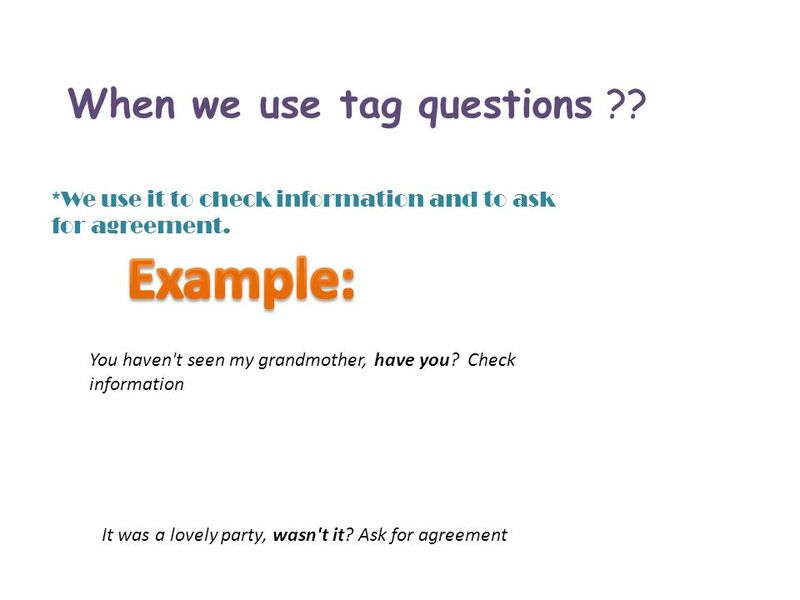 TAG QUESTIONS A tag question is a question we can add to the end of a statement. Statement…,is it?,isn’t it?,are they?,aren’t. REPORTED SPEECH Developed by Ivan Seneviratne. Asking Questions Bridget Green Grammar MFWI 2007. 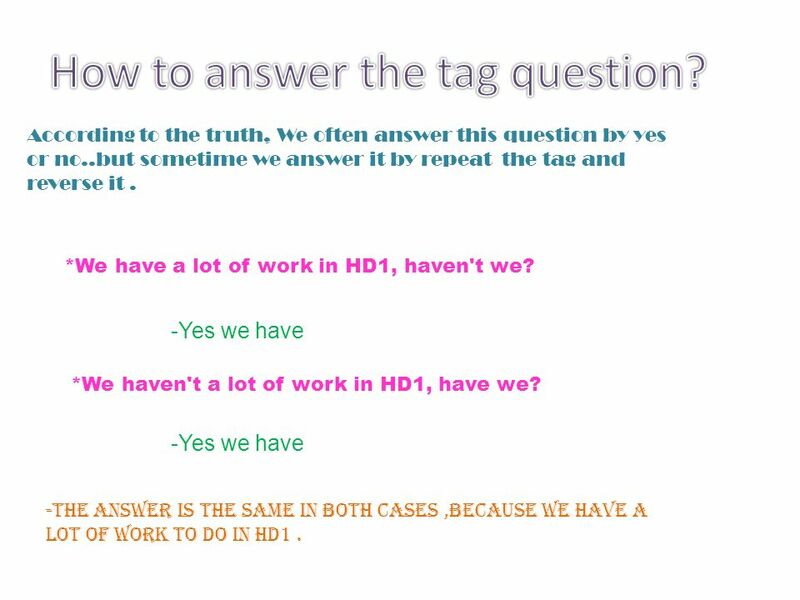 Using Tag Questions Using Tag Questions. She's very beautiful, isn't she? Question Tags By teacher Silvino Sieben 3ª série EM. Question tags. 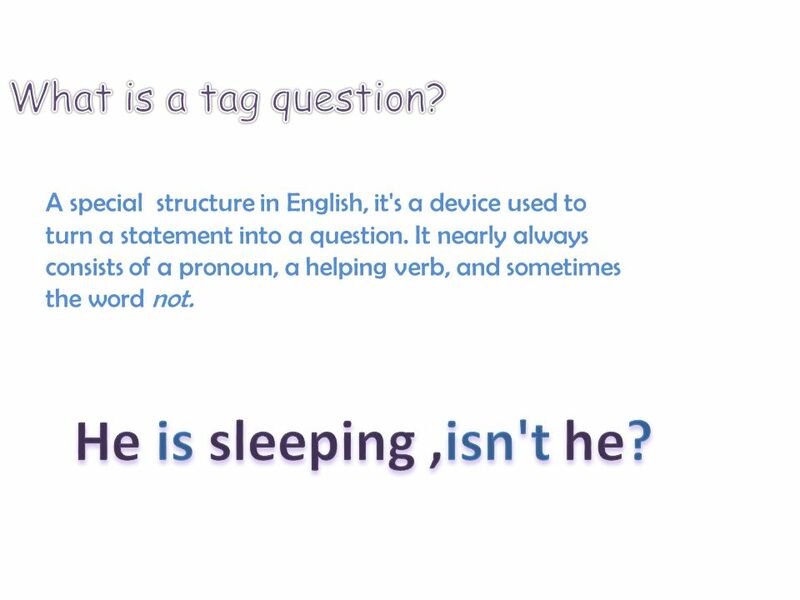 USE A question tag is a short question at the end of a statement: He won the prize, didn’t he? 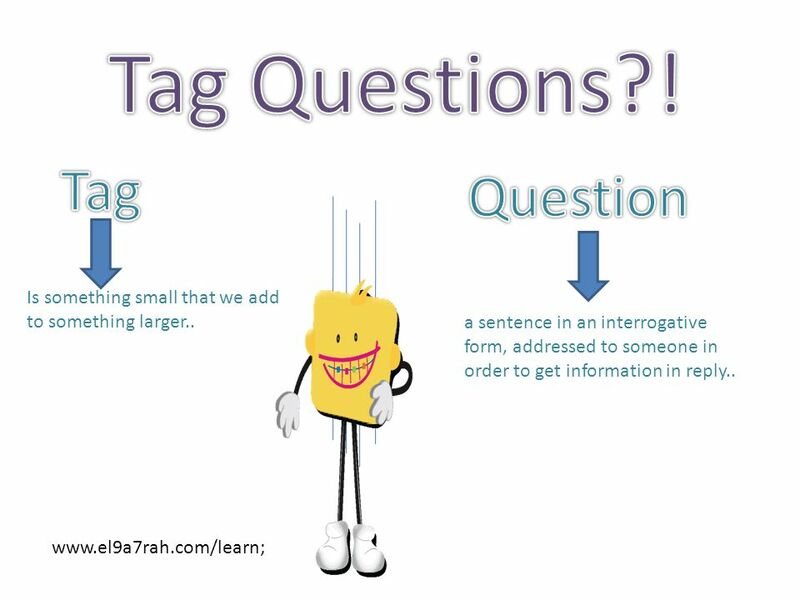 question tag We use question tags when we. Tag Questions Ms. Suthiya Mano. MAKING CONVERSATION Introducing to someone and finding information about them VY_32_INOVACE_13-09. Relative Adverbs Essential Question: How can I use relative adverbs in the correct context to improve my reading and writing? ELACC4L1a. Use relative pronouns.